Save time and money - Micro Management's DHCR Export feature collects and reports your registration data - eliminating the need for expensive third-party processing. 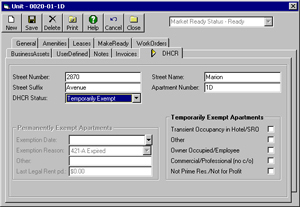 Micro Management allows users to export key system, property, owner, unit, and tenant information for Rent Stabilized properties. 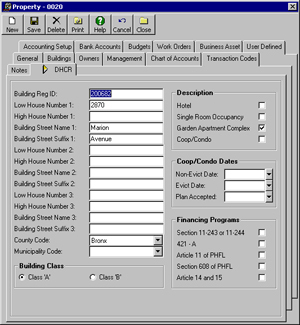 This information may then be imported directly into the NYS Division of Housing and Community Renewal's (DHCR) PC Rent Registration software package. REMANAGE also prints the standard DHCR Rent Stabilized lease renewal forms - on blank paper. No more forms to buy! Micro Management supports the unique requirements of cooperative housing. Properties can be defined as Cooperative. This alters the way shares are treated on the lease and unit levels. Instead of a % (for condos), coop shares are represented as a whole number. This data may be used to create a batch of 'Assessment' charges for a selected property or portfolio and generate reports relevant to Coop management. An automated lockbox service eliminates the tedious and time-consuming task of manually printing rent statements and processing customer payments, thereby reducing your costs, saving you time and eliminating clerical errors. Lockbox service is provided by banks and other service bureaus. Each month Micro Management customers automatically create, zip, and email a file containing billing information for one or more properties directly to Micro Management. That information is then translated into a format for printing laser rent statements, sorted, stuffed into envelopes, and returned back to the client for distribution to their buildings. Optionally, the client can have the statements mailed directly to the tenants and even have notices inserted with the bills. Residents mail their checks to the lockbox provided by the bank. The bank processes the payments by scanning the remittance slip and encoding on the resident's check. The payments are then immediately deposited into the client's account. Each day, the clients download a file from the bank and import that file into Remanage. Receipts are automatically credited to the proper accounts and a deposit record is created for each bank account affected by the receipts. DHCR Export Report. Users registered to use REMANAGE's DHCR Export function can use the DHCR Export Report to review and verify the information that will be exported for the selected property(ies), before actually creating the export file. Form 1098 Cooperative Report. The Form 1098 Cooperative report prints 1098 information for all qualifying leases in a selected Property on blank 1098 Mortgage Interest Statement forms. Form 1098 Cooperative - Information. The Form 1098 Cooperative - Information report displays a summary of the information that will be printed by the Form 1098 Cooperative report for the selected property. This report is intended to provide a method to audit the 1098 information before actually printing the 1098 forms. Micro Management's enhanced notes system saves you time by allowing you to define custom legal codes that allows you to track tenants as they proceed through the legal system. For example, you could track 3-day notices, warrants, stipulations, and evictions. Each day you can run reports that give you a status of all these "dispo" tenants, and even run follow-up reports that let you know what actions need to be taken on certain dates.